Who doesn’t love to toss sticks or leaves into a stream and watch them move in the current? Who doesn’t love mysteries? In Stream Detectives, students get to explore a stream, figuring out how the currents move by using stick and leaf “boats” to track the speed and direction of different currents. Students learn about some of the factors that affect current speed and direction (hydrodynamics), how water shapes stone (weathering), how the channel of a stream changes over time (stream morphology), and how the speed of the current affects the size of sediment that it leaves behind (erosion). Then, they apply this knowledge by using a Stream Detective Key to figure out how the stream features they see in the moment formed in the past, and to predict how they might change in the future. Students learn skills and concepts they can use to interpret and learn about any stream they encounter. Draw a map of a section of a stream, including the speed and direction of the currents. Make explanations about how currents in streams form. Learn that larger sediments are evidence of faster currents, and smaller sediments are evidence of slower currents. Think about how water moves, and how weathering and erosion create and shape stream features. 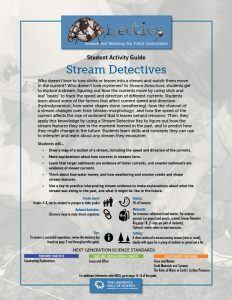 Use a key to practice interpreting stream evidence to make explanations about what the stream was doing in the past, and what it might be like in the future.